The Hudson Valley Senior Residence is for seniors who need assistance with some of the aspects of daily life, but wish to live as independently as possible. We are proud of our conscience staff who adheres to the philosophy of ‘we care about you as well as for you’ - and we have a very low staff turnover rate which helps to assure continuity of care. Residents receive delicious home cooked meals with attention paid to special diets and personal likes as well as evening snacks and refreshments at social events. 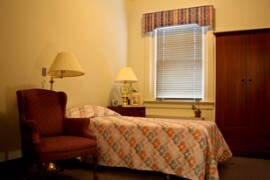 The Hudson Valley Senior Residence helps to bridge the gap between living at home and living in a nursing home. We encourage independent living - but offer services that make sure all the needs of life are taken care of. 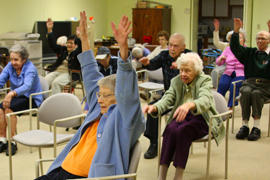 A full calendar of supervised daily activities helps to encourage socialization and keep residents active and healthy. A beauty shop and barber are on site, and other services include such things as housekeeping, linen changes, and personal laundry services. We serve as liaison with each resident's personal physician to assure and arrange for proper medical treatments when necessary. We provide medication supervision, and monitor and refill prescription medications in a timely manner. Physician and podiatry services are available on site. We also offer supervised showering in the privacy of one's own room and assistance with dressing when necessary. The Hudson Valley Senior Residence is located in Kingston, NY - the Heart of The Catskills - and the county seat of Ulster County. Kingston was the first Capital of New York State, and is rich in history dates back to 1652. There are many great restaurants and plenty to do in Kingston and the surrounding area while you visit your friend or family member at the Hudson Valley Senior Residence. Please click over to our Contact Page for directions from the New York State Thruway. Kingston is right in the heart of the Hudson Valley, about half way between Albany and Westchester County.